The overflow crowd Thursday night at the Marian Miner Cook Athenaeum was far more welcoming and gracious compared to the stern faces Sherman has often encountered during her decades as a diplomat. The ambassador, this semester’s featured Res Publica speaker, opened her remarks by praising Claremont McKenna for offering such a “student-centered experience” through the Ath. Sherman pointed to her upbringing in the city, specifically, a moment in 1963 that shaped her personal values. In solidarity with the Civil Rights movement, Sherman’s father publicly supported open housing and racial integration through his real estate firm. The position was unheard of in Baltimore at the time—and within six months, he lost more than 60 percent of his listings. By 1968, his office had closed. 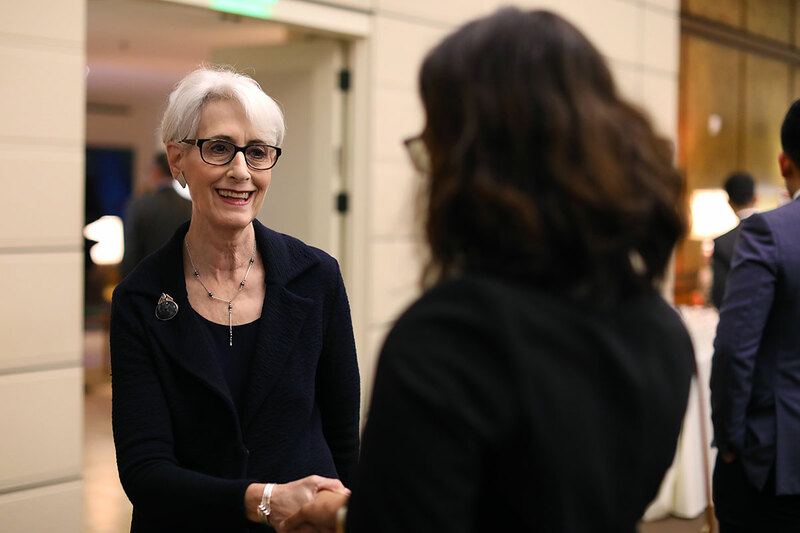 Moral leadership has been a bedrock principle for Sherman during her accomplished diplomatic career. She’s had to summon inner courage and conviction to navigate disparate gender and power dynamics as one of the lone women of authority in high-level political settings. “Understanding power, and making good use of it, is crucial in diplomacy and in life,” Sherman said, noting how Madeleine Albright once told her that personal power as a woman was important, but it did not outweigh the responsibility of being a negotiating representative of the United States.